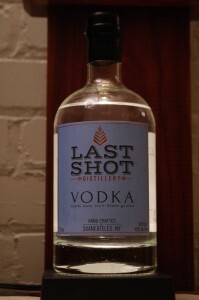 Notes: Last Shot Distillery is one of the newest distilleries in New York State ( producing, selling, and aging products – not just setting up their facilities as many are). Run by Chris Uyehara and a very small team, Chris is a master chef and pastry chef and brings his art and attention to detail to all his products. Made in small (about 100 gallon) stills, they concentrate on small batch and quality. 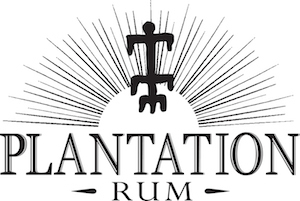 Their current line up includes this nicely flavorful ( but not flavored) vodka, an exceptionally good white whiskey, and an unaged “Moonshine” 100 % local corn whiskey . 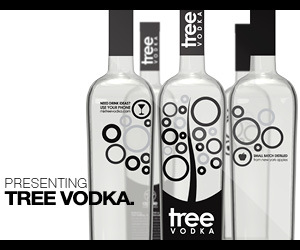 The Last Shot Vodka is made from a mix of New York Corn and New York Malted Red Wheat. Which brings me to another point I wish to make and a distinction to draw. Traditional European Vodka meaning roughly pre 1900 was made in pot stills with distillation/rectification topping out at roughly 160 proof leaving a lot more flavor than our current 190 proof column still yield which is mandated by American law and enthusiasticlly embraced by the fear of flavor American style vodkas. A further distinction is the use of Reverse Osmosis or RO water as it is called in the trade. This is essentially distilled water in which all minerals and taste have been stripped out. RO is a more aggressive shade of pale. Try drinking a full pint of the stuff – you probably can’t, it is awful in its total lack of flavor. It is another new innovation embraced by the fear of flavor crowd. The use pure ethanol and stripped out water to deliver a ethanol delivery vehicle that is completely bland, and to a great degree, one major brand is much like another. This vodka is a much more European style vodka and bears no resemblance to the above. The corn provides a nice body, depth and a little oiliness from the corn proteins along with creamy notes while the red wheat adds a nice definition and firmness, while the water and its minerality adds structure. If I were to use anatomical analogies the water would be the skeleton, the wheat the muscles and the corn provides the fat and flavoring to deliver an integrated package the same way a well marbled bone in piece of meat does. All the grain they use for all their products are grown locally and they use the water from nearby Skaneateles Lake which is a deep aquifer spring fed lake known for the quality and purity of its water. Appearance: Clear as a bell, with a nice heavy looking body to it. On swirling it coats the glass nicely then retreats first very long legs then a constellation of droplets and a coating on the glass. The most outstanding and tenacious body we have seen in recent memory ! Taste: Buttery, oily entry slightly sweet with a nice backbone and a slightly minty, grassy, tingle that tingles but does not burn, yielding to a drying,mineral stone finish with a nicely sweet then drying spicy taste. Bottle: Quite similar to the other products they put out and only differing in minor details ( such as type of whiskey of course) Well done and distinctive label – unlike most. Clear glass apothecary type bottle with a black topped ridged stopper which is particularly convenient as it affords a good grip for easy opening. Composite cork guaranties a good seal and no loss or leakage. Sealed with a black neckwear that is easy to remove. Overall a very attractive and easy to spot package on a store shelf, back bar, or home bar. Well done ! Other: This vodka is so good that noted vodka expert and connoisseur Zamir Gotta praised it as one of the best craft vodkas he ever tasted and he went so far as to actually buy a bottle ( which if you know Zamir means something – especially since he had access to my vodka library whenever he is here – so he was not just running out).